How does the Single Sign On (SSO) integration feature work? Our Single Sign On (SSO) feature lets your course automatically identify users who are already logged onto your website. This feature is used when you have embedded a course on your website or when you have information about the user such as their name, email address & id that you wish to automatically pass on to the course. This way, learners are automatically identified and they don’t need to enter their name, email or id to take the course. Why is Single Sign On Needed? This feature is very useful when you have a large number of learners logged onto your website, to take courses. By using Single Sign On, learners are automatically identified by the course, which saves learners from the inconvenience of repeatedly entering their information each time to take the course. This also makes the overall system more secure as users are identified by the system rather than trusting the user to enter the correct identifying information. How do I integrate & use Single Sign On? The course would then automatically pick up the name, email address & id of the learner that is passed and not ask the user to type this in. Example: See the URL below. Notice that email and name boxes are not shown to the learner. The system already knows the user and prevents the learner from typing in this information again. 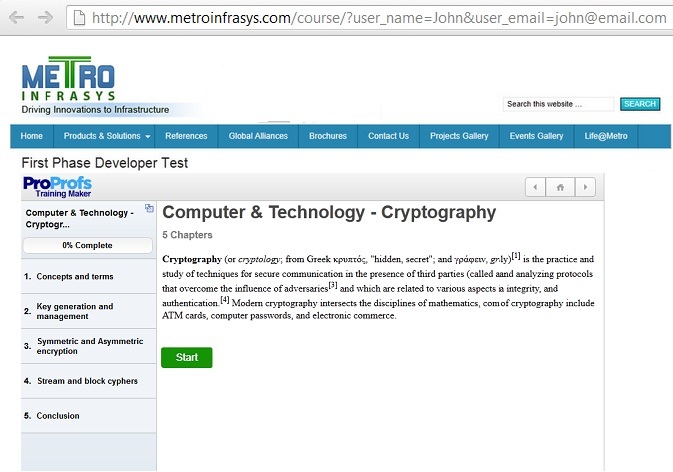 Let’s take an example of your website url (link) where you have embedded the course. You need to provide these three variables with the course page url, where you embedded the course on your website. Related article: How does the API allow me to capture learners data and insert it in my own database/website?